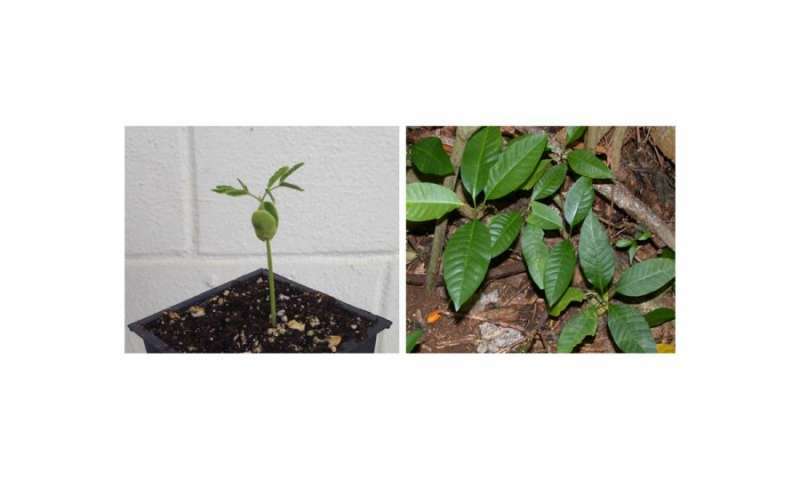 Photos showing a newly emerged Serianthes nelsonii seedling (left) and cluster of Tabernaemontana rotensis seedlings (right), two rare trees native to Guam that could benefit from sustainability research. Credit: Thomas Marler. Scientists in Guam have published a study they say can inform management decisions for conservation nurseries. The research from Thomas Marler and April Cascasan from the University of Guam and John Lawrence from the United States Department of Agriculture, Natural Resources Conservation, was published in the July issue of HortScience. The researchers noted that their study was the first experimental approach to determining influences of light and storage on seed and seedling behavior for any rare and threatened tree species from the Mariana Islands. "Several tree species that are native to the Mariana Islands are characterized by limited regeneration potential and extensive habitat loss, and the need for formal conservation has become paramount. Elaeocarpus joga, Serianthes nelsonii, and Tabernaemontana rotensis are three of these species," the authors wrote. "Germination and early seedling growth studies on rare taxa are critical for prescribing optimal nursery protocols to produce plants for use in urban managed forests, conservation plantings, or reintroduction into natural areas for species recovery efforts," they said. The team set out to determine the influence of a range of ambient light exclusion levels on seedling emergence and early seedling growth traits of the three species. The study was also designed to determine the influence of 9 months of seed storage on seedling emergence percentage. "The three species occupy the same forested habitats in their native range, and nursery managers may be tempted to assume the horticultural needs for germination and early seedling growth may be similar," the authors said. "In contrast, most response variables were highly contrasting among the taxa." Seedling emergence percentage and velocity were maximized in moderate shade for Elaeocarpus joga, deep shade for Serianthes nelsonii, and full sunlight for Tabernaemontana rotensis. Seedling height was increased by shade for E. joga and S. nelsonii. Height of T. rotensis seedlings was not influenced by incident light from 25% to 100%. "No single level of shade was optimal for all three of the taxa we studied," the authors said. "However, incident light in the range of 50% to 75% of ambient light would be adequate for E. joga and T. rotensis in a single nursery setting." Other findings of the research indicated that 9 months of seed storage at ambient temperature did not influence emergence percentage of Elaeocarpus joga or S. nelsonii seeds. "In contrast, seeds of T. rotensis began declining in seedling emergence percentage between 2 and 3 months of storage, and seedling emergence was nil by 4 months," the scientists noted. According to the authors, the study results provide benchmark details for germination and early seedling growth of three rare endemic species, and help decision-making move toward more effective conservation efforts.